Everything about Fantasia is beautiful. The segway into the animation, from swirling objects representing sounds into a simple forest is beautiful. The music, all familiar classics everyone knows, are of course beautiful. The colors, from the timid blues of those early moments to the bursting ballet of richness in “Night of Bald Mountain,” is beautiful. Every frame of the animation is a piece of immense art, a visual flair and style given such weight and enormity that it sweeps up the viewer in its wonder. It was gutsy too, the 1940’s audience shunning it until time has finally given it the audience it so richly deserves, people who can appreciate it for the level of technical acuity and the masterwork that created. There is a rhythm to it all, a flow too, that keeps the pieces moving as one, much like the music itself. It’s all such a natural fit, the images that appear on screen seem like they were crafted the second the music composition was completed. Political correctness has sadly marred a few images over the years, the Blu-ray release no exception as “Pastoral” has been unnaturally zoomed in to block the offending racist images. Regardless of what they mean or what they stand for, they are part of a masterpiece, and censoring that does no one any favors. Picking a single piece from Fantasia, claiming that to be superior than the rest, feels so shortsighted. Despite their vast differences in color, tone, style, and character, they all blend marvelously. Missing any of them would be missing the full wonderment of it all, the balance that keeps this engaging held together almost fragile in a way. Without question, the animation is a marvel too, the mountain of living broomsticks in “Sorcerer’s Apprentice” an achievementm all moving with the same fluidity as when only one was on screen, and ballet of “Dance of the Hours” producing the same precision as any true live act. Even prior, Fantasia establishes its uniqueness, the bizarre shadowy effects of the orchestra at work, lit to specific color palettes, is like everything in Fantasia: beautiful. Fantasia’s blend of live action and animation does separate it ever so slightly from the typical animated fare. It is well known that Disney utilizes a precise application of DNR on their animation titles in order to preserve not the film, but the original animation cells themselves. That works fine here as well. Where the live action is concerned, the harshly lit Deems Taylor narrating the piece, it looks a little to digital in those brief interludes. There is a mysterious absence of grain here too that calls this into some question, while the rigid separation of colors looks wildly unnatural. Those breaks are of course brief, leaving the animation to speak for itself in all of its glory. Nothing can be generalized about the color even within a specific piece, “Sorcerer’s Apprentice” dipping into a static black and white as Mickey panics. When he is in full garb, the striking reds are rich and bold. Yen Sid the sorcerer is clothed in a blue cloak containing the same level of vibrancy. The boldest of the pieces, “Pastoral” holds rainbows, multicolored centaurs, and bright environments that are given new life here in HD. Those more subtle pieces, “Rite of Spring” darker and somewhat more furious (for a lack of a better term), represent those distressing hues flawlessly. The deep blacks, imperative to the success of “A Night on Bald Mountain” are staggering in their intensity, never once losing focus of their goal. Clarity is perfect, matching any previous Disney effort in terms of the animation itself. 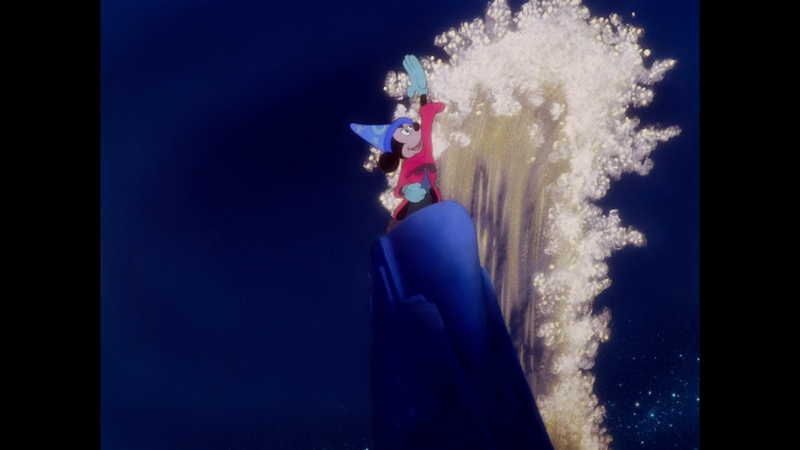 A variety of effects are utilized, “Bald Mountain” created at times with a unique multi-glass set-up that still holds firm with the perfection these Disney catalog titles have set a standard for. Lines are pure, and simpler sketch-like qualities of the early pieces are as defined as any other. Each pencil stroke is visible, free of any distracting flaws like aliasing. It doesn’t matter what is tossed at this AVC encode as every frame is visible compression free, presented with a new level of detail and sharpness. It’s a hi-def marvel. Fantasia has a unique audio history, at one point in the 1980s completely re-recorded to take advantage of the new fidelity available and avoid a loss of clarity from the original material. It was also the first (and only) film to use Fantasound, a complex means of recording and then playing the audio back in theaters with a four-track sterophonic system that few theaters could actually utilize. Regardless, what is here is something to cherish, a full-fledged 7.1 effort that using “enveloping” as an adjective to describe in words doesn’t even seem to cover it. Clarity is magnificent, from the highest highs to the lowest lows. There is no discernible distortion at any point, the power of it all quite staggering. Playing at an exceptionally loud volume is hearing it like it was meant to be, making it easier to appreciate the purity of the audio. This is not overdone, or 7.1 for the sake of 7.1. On the contrary, it adds life to the mix where a stereo track could not, the sweeping music just that, littered with little flourishes as the audio travels about. Instruments can be audibly heard passing throughout the soundfield gracefully. It’s not gimmicky. The stereo split is flawless, Mickey appearing in silhouette at 39:02, before leaving the stage on the left creating a memorable effect. His voice, done by none other than Walt himself as always, is the only time there is a discernible dip in fidelity, the overdub somewhat scratchy in comparison. There are three commentaries here, the first a solo effort from Disney Historian Brian Sibley. The second is comprised of interviews with Walt Disney, hosted by animation historian John Canemaker. Canemaker joins Roy Disney, Conductor James Levine, and film restoration manager Scott MacQueen on the third. A tour of the incredible Disney Family Museum feels far too brief given the wealth of information inside. The Schultheis Notebook looks at a newly uncovered book detailing the special effects of the film, answering numerous questions about how it was done. An interactive art gallery includes images from the original and Fantasia 2000. Trailers remain.